To know them is to love them! In this section you will find out exactly how a mango should be treated, with great tips on how to how to peel, slice, cut and serve mangoes to enjoy them to the fullest. To cut a mango in this way, you will need a large kitchen knife, a vegetable peeler and a corn-on-the-cob holder. Hold the mango in one hand and peel the mango with a vegetable peeler. Put the peeler away. Slice off the top and bottom of the mango with a knife. Insert a corn holder into the mango from one end. This will steady the mango while you slice it. The mango can actually stand by itself which is very helpful. Hold the corn holder and slice off the cheeks. Cut the flesh off the pit carefully. Your mango is ready to be sliced or cubed, according to your recipe. Enjoy! To cut a mango in this way, you will need a very sharp knife, preferably with a serrated edge. This method works best with firmer mangoes as perfectly ripe mangoes are too fragile to handle in this manner. Hold the mango sideways and insert the knife under the skin very close to the surface at the top of the mango. Slowly peel a thin strip of skin off the mango along the curvature of the fruit as if you were peeling a potato. When the entire mango has been peeled in this way, insert your knife into the flesh as close to the wide surface of the stone as possible. In see-sawing motion, work your knife blade along the length of the stone all the way through to the other end of the mango as if you were filleting a fish. Cut the chunks of mango flesh crosswise or lengthwise into thick slices. Enjoy! Remove mango cheeks one at a time with a sharp knife by slicing as close to the stone as possible. Score 3 or 4 lines vertically down each cheek and 3 or 4 lines horizontally to form a hatched pattern. Take care not to cut through the skin. Firmly hold both edges of the fruit and turn the cheek inside out. The cubes can then be sliced off and used in drinks, salads, desserts and other recipes. Let your imagination run wild! Cut the cheeks from one mango. Use an acrylic glass to scoop the flesh from the skin. The cheeks can be sliced into thin strips to use in desserts, salads or other recipes. Mango makes a welcome addition to any table with its delicious taste, smooth texture and attractive aroma. The versatility of the mango lends itself to exciting and innovate presentations, depending on your recipe or the occasion you are catering for. To find out how to best serve a mango, see our mango serving suggestions below. Cut off both ends of the mango with a sharp knife. Peel from top to bottom along curvature of the mango using a vegetable peeler. Cut fruit into thin slices by carving lengthwise along the stone. Fan onto a plate and garnish in the middle with flowers or a serving of cottage cheese. Slice off the mango’s cheeks lengthwise on both sides, cutting close to the stone. Separate the mango’s cheeks completely from the stone, saving the tasty center. Use a spoon to scoop out the mango flesh from the cheeks. Arrange in a pile on a plate, garnish and serve with a fork. 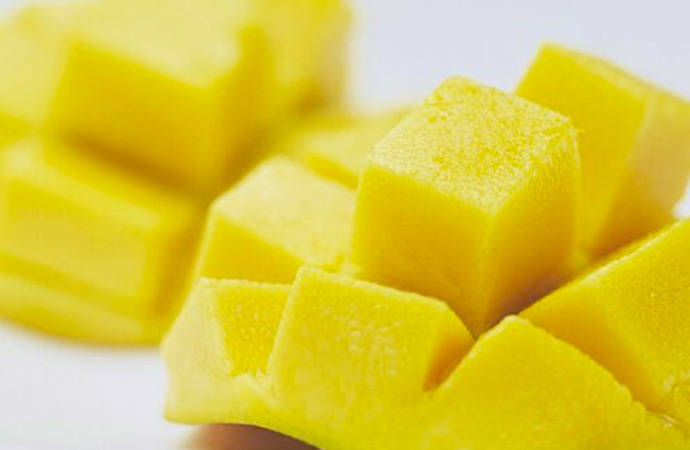 Use the hedgehog method of peeling to obtain mango cubes. Turn the scored mango halves inside out to separate the cubes. Slice off squares with a knife into a bowl. Serve fruit on its own with a fork or add a dollop of whipped cream on top before eating. 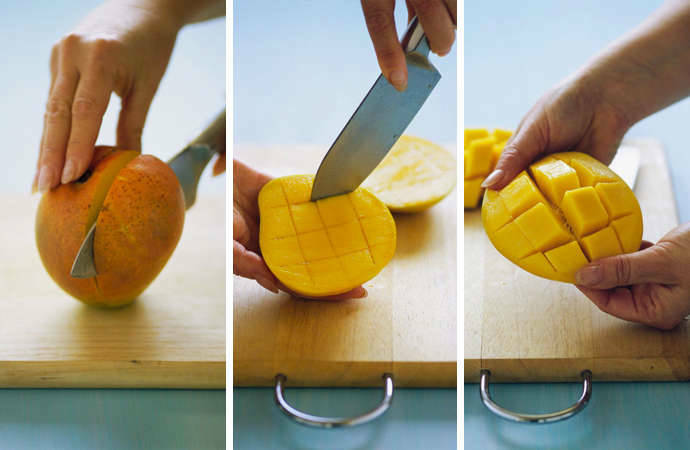 Cut the skin of your mango on top crosswise, creating four sections. Pull the skin away from the mango until half-way down the length of the fruit, leaving the skin flaps hang slightly away from the mango, creating an attractive rose-like look. Place the uncut bottom of the mango on a fork and serve.